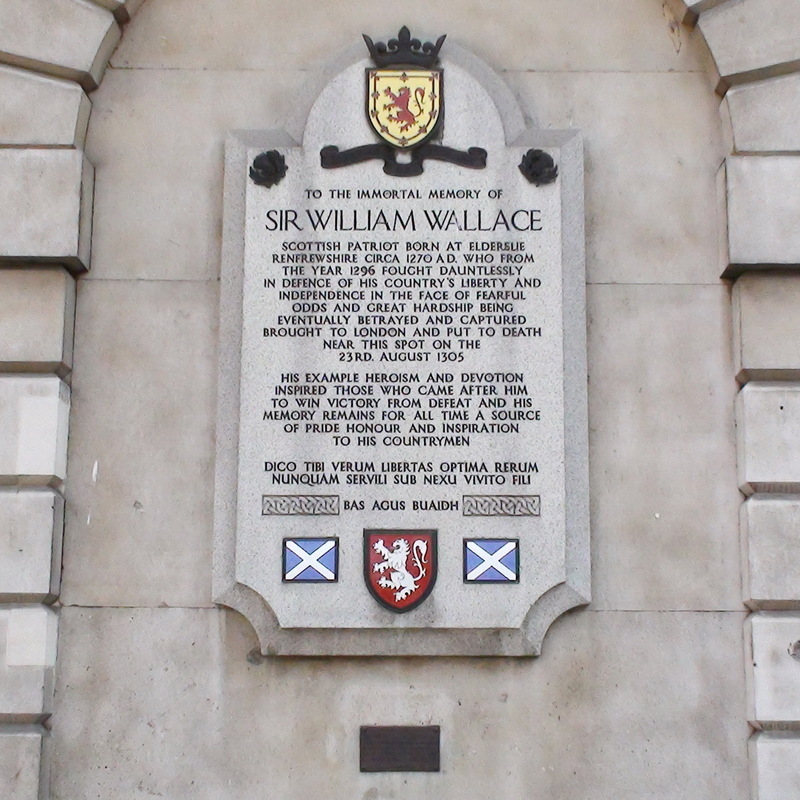 To the immortal memory of Sir William Wallace, Scottish patriot, born at Elderslie Renfrewshire circa 1270 AD, who from the year 1296 fought dauntlessly in defence of his country's liberty and independence in the face of fearful odds and great hardship, being eventually betrayed and captured. Brought to London and put to death near this spot on the 23rd August 1305. His example heroism and devotion inspired those who came after him to win victory from defeat and his memory remains for all time a source of pride, honour and inspiration to his countrymen. Dico tibi verum libertas optima rerum nunqual servili sub nexu vivito fili. 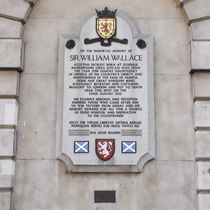 This memorial was placed here by Scots and friends at home and abroad by kind permission of the governors of St. Bartholomew's Hospital and unveiled on 8th April, 1956. 2019: Scott Kelly informed us of the work he and his colleagues do, looking after this monument. It's a splendid memorial and we thank them for their work. The front elevation of this building is very odd, especially at the roof-line. To end up like this it must have an interesting history. The frieze inscription above the pillars must have been installed when the building was enlarged. At ground floor level there are 3 blanked-off window bays, just perfect for memorials, left to right: Peasants' Revolt, Wallace, Marian Martyrs.